You don’t have to look far to discover Electrocomponents’ ambition. “BECOMING FIRST CHOICE” is the title of its annual report this year. But that strapline is one of the last things I found out about the company while evaluating the share. I discovered Electrocomponents using the simplest of screens in SharePad, learned more about it through the program’s financial charting, and then switched to the annual report, getting to the front cover last in customary fashion. Electrocomponents first gained my attention as distributor of the Raspberry Pi, a tiny computer it sells for the price of an alarm clock. I came across it again when I wrote an article describing SharePad’s text filtering and how to find companies that speak your language. It was one of the companies I found, because its reports use words and phrases I associate with strong businesses, like “customer service”, “employee engagement” and “profitability”. I’ve found it again using a data filter as my starting point and this time I’m taking a closer look. The filter casts a wide net for profitable companies in industries I know something about. By screening for companies with earnings per share greater than zero and excluding certain industry subsectors, it rules out businesses that fail to meet my minimum threshold of viability (a profit), and industries that I have little inclination to investigate – banks, insurance companies, oil companies and miners mostly. Having filtered all the shares listed in London, I applied my “Key dates” List setting and sorted it by the Previous Annual Report column. The companies with the most up-to-date annual reports are near the top of the list. We can quickly step through lists like this ruling out companies that, for one reason or another, are not good prospects. I flit between the Summary tab in the green Financials view of SharePad, which tells me what the company does, and SharePad’s financial charting until I find a business that intrigues me. I found one on my sixteenth bite of the cherry, a distributor. Distributors are uncomplicated businesses. They buy products from component manufacturers and sell them on to equipment manufacturers. They grow by sourcing new products, expanding the territory they supply, or adding value to the products they sell by providing technical support, configuration, customisation and other services. The more products they stock and the more services they offer, the more valuable they are to customers who generally try to limit the number of suppliers they use to reduce administrative overheads. The more customers they have, the more likely manufacturers will want it to distribute their products through them. It is a virtuous circle. Although manufacturers and distributors work together to supply things, they are also in competition to increase their share of the total profit from the products they sell. Manufacturers sometimes think of their distributors as merely stockists – warehouses supplying their products on demand. Distributors prefer to be extensions of their suppliers’ sales teams – experts advising, equipping and managing supplies for their customers. When a distributor manages the customer relationship, it can do very well. When manufacturers can make the sale though, they’ll extract better terms from the distributor or bypass it altogether. Electrocomponents might make a good investment in it is own right, but it is also interesting because it is a customer of power supply manufacturer XP Power, a company I know well, a manufacturer that used to be a distributor. 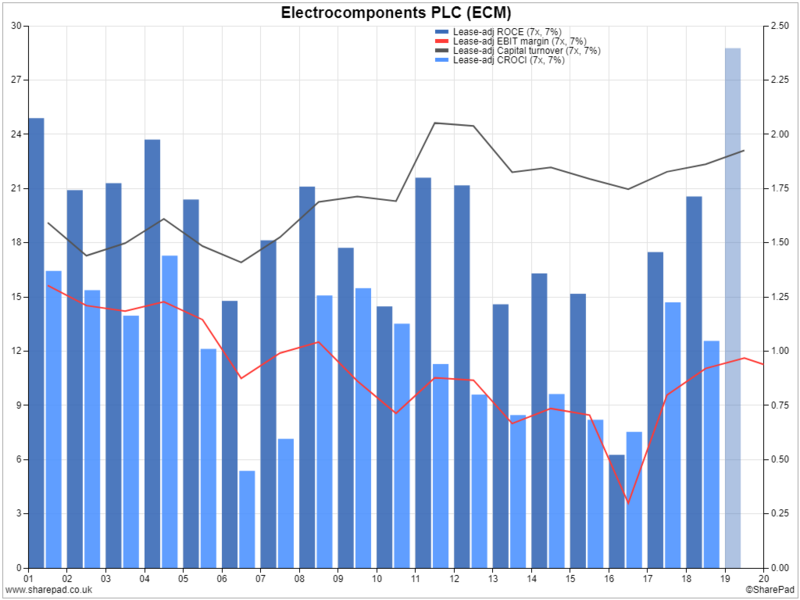 Electrocomponents has earned impressive returns on capital in the past (the dark blue bars), and cash returns are acceptable too (light blue bars). Cash flow at a growing distributor like Electrocomponents, may not be as high as accounting profit because the profit figure is manipulated to match costs to revenues, spreading out the cost of doing businesses: investment in warehouses, automation, software and buying stock for example. The Return on Capital employed calculation is also calculated before tax is charged to profit, while the Cash Return figure includes the tax paid. Just by glancing at the chart we can see Electrocomponents typically earns 15% return on capital or more, and its cash returns are generally at least half of accounting profit. Generally, I question a firm’s quality if it has earned less than 10% return on capital employed or allowed cash flow to turn negative in any given year. In 2016, when steadily declining profit margins collapsed to about 4%, return on capital employed at Electrocomponents fell to 6%. 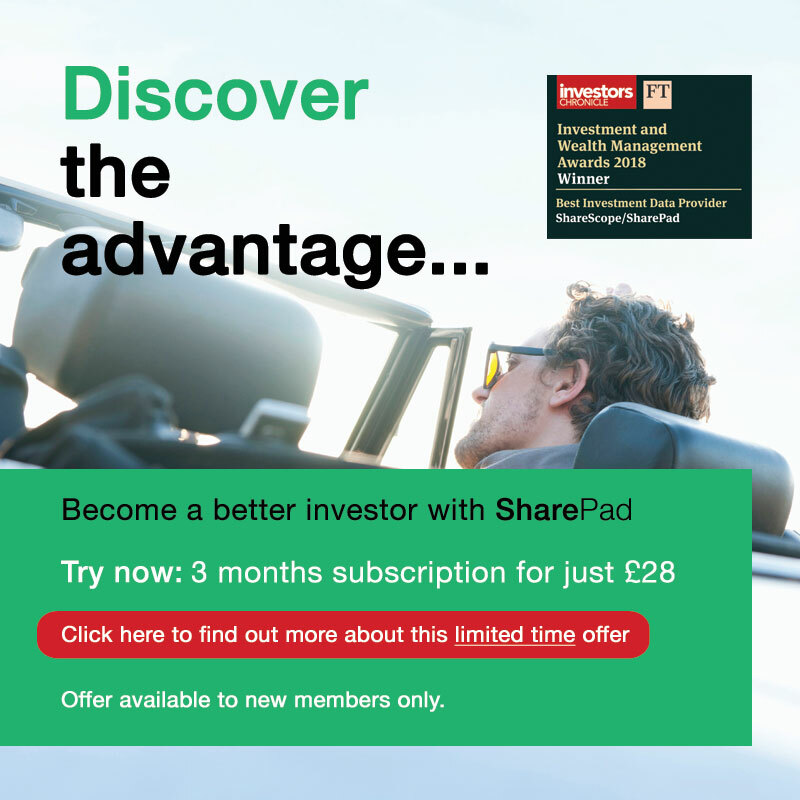 Had I been looking at SharePad then, I might have assumed it had become uncompetitive. Now return on capital employed is back above 15%, and profit margins are above 10%, it looks like a strong business again. To see what’s changed, we need to take a look at the annual report. 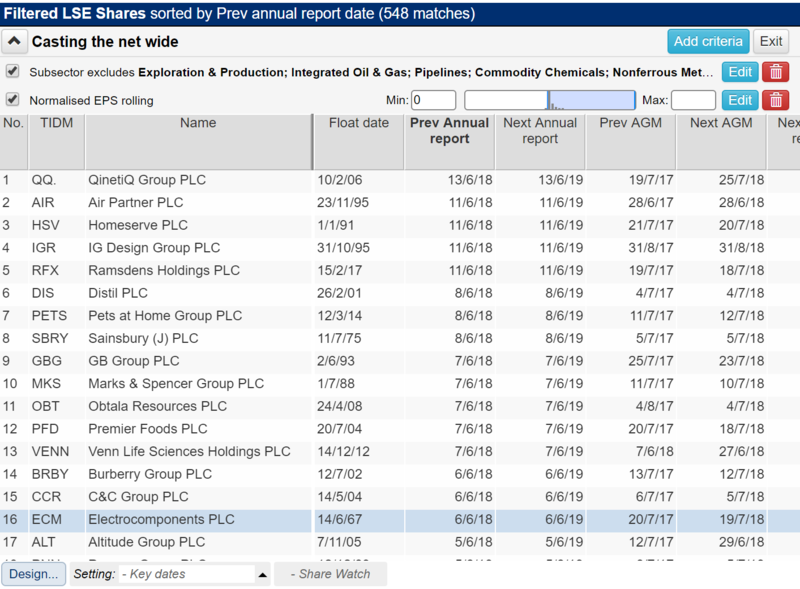 All listed companies publish their annual reports on their corporate websites, which you can find in the Company info section of the Company tab in SharePad’s Financials view. I’m impressed with Electrocomponents’ report. It is feeding the virtuous circle, keeping customers and suppliers happy by stocking an increasingly wide range of products, while reducing costs by automating its warehouses and websites and selling more online. A new chief executive and a new financial director, brought in to lift the company’s ailing profit margins, are simplifying the organisation, standardising processes and sharing services – work they describe as only half done. Electrocomponents is also beefing up services having recruited 650,000 engineers and students to DesignSpark an online community where customers and potential customers can ask questions, as well as download free software and engineering schematics. In May, the company acquired IESA, a cloud-based platform that helps businesses to manage their suppliers and reduce costs. About 12% of revenue comes Electrocomponents’ own value-for-money brand, RS Pro (think AmazonBasics). The numbers the company has chosen to judge itself by, its key performance indicators, reassure me too. Electrocomponents uses similar statistics to the ones I judge it by. It is focused on earning high returns on capital, lifting profit margins into the mid-teens, and maintaining strong cash flows, as well as increasing revenue at twice the rate the market grows. It believes two advantages will help it grow this fast: a global footprint and digital leadership. Electrocomponents trades around the world as RS, except in the Americas, where it is Allied (acquired in 1999). In 2018, it passed £1bn in annual revenue online – more than 60% of the total – which, it says, makes it a global leader. We are unique in the marketplace with our global footprint, strong salesforce and leading digital position and, as such, are an important partner and lead generator for our suppliers. Being the best at something lots of other companies do is mostly a function of size and efficiency. To be confident in Electrocomponents’ prospects I’d not only need to be confident it is doing the right things, I’d need to be confident it is already biggest and best. That way the competition would have to work even harder to overhaul it. The biggest and best online distributor with a global footprint would make an enticing prospect, but I don’t yet know if Electrocomponents fits the bill. Confidence is required, because the shares aren’t obviously cheap. According to SharePad, they cost about 21 times earnings in the year to March 2018 (adjusted for debt), a year in which profit benefitted from currency movements and a benign economic backdrop. There’s also the small matter of Brexit. 80% of RS components are routed through the UK for global distribution; it is easy to imagine tariffs and regulations having a big impact. Electrocomponents has joined my watch list, and getting a better understanding of its competitors has joined my To do list!